DALLAS – Military shoppers looking to make their proposals pop this season will find no shortage of inspiration in the Army & Air Force Exchange Service’s Brides & Grooms Spring 2016 Catalog. Featuring a carefully curated collection of engagement rings, bridal sets and wedding bands, the 36-page guide contains every piece of jewelry Soldiers, Airmen and their families need to tie the knot, from popping the question to the big day itself. The catalog features the new Patriot Star™, a 106-facet specialty cut diamond exclusively designed for the Exchange and certified by GemEx and the International Gemological Institute. Firestar Diamond, manufacturer and supplier of Patriot Star Jewelry, donates a portion of all Patriot Star proceeds to the Fisher House to benefit military families. The catalog also includes a selection of pearls, earrings and bracelets that will complement any bride’s wedding-day ensemble. Grooms can top off their look with stylish watches from Tag Heuer, Coach, Michael Kors and more. The Brides & Grooms Spring 2016 catalog is available at main stores and online at www.shopmyexchange.com/savings-center/interactive-product-catalogs. Prices in this all-services catalog are valid through June 30, for any authorized Exchange customer. Active-duty military members of the Army, Air Force, Navy, Marines and Coast Guard, as well as military retirees, reservists, National Guardsmen, Department of Defense civilians stationed overseas, Exchange associates and their family members are all authorized to receive Exchange privileges. For more information or to schedule an interview with an Exchange representative please contact Conner Hammett, 214-312-2714 or hammettc@aafes.com. 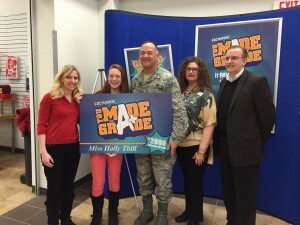 DALLAS – The grand-prize winner in the Army & Air Force Exchange Service’s You Made the Grade sweepstakes has more than just good grades. She has a big heart, too. Eighth-grader Holly Thill, 14, took home the top prize in the Exchange’s semiannual sweepstakes, part of a program to reward military students for academic success. Holly, who is home-schooled in Beavercreek, Ohio, and earns mostly A’s, was awarded a $2,000 Exchange gift card during a presentation at the Wright-Patterson Air Force Base Exchange on Feb. 5. With part of her winnings, Holly plans to buy blankets and coats to distribute to the homeless in Ohio through her church, Emmanuel Catholic Church, in Dayton. The military holds a special place in Holly’s heart. She and her six younger siblings have grown up in a military family. Her father, Lt. Col. Joseph Thill, is the deputy director at the Air Force Research Laboratory and has served in the Air Force for 22 years. Holly’s mother, Bridget Thill, served in the Air Force for nine years as well. The worldwide sweepstakes also awarded second- and third-place prizes. The second prize, a $1,500 Exchange gift card, was awarded to Grace Yuquimpo, a 10th-grader at Seoul American High School at U.S. Army Garrison Yongsan. She received her $1,500 gift card during a presentation at the Camp Casey Exchange. Grace travels by bus nearly two hours each morning to her high school. After school, she plays sports, including varsity basketball and varsity soccer. But, she still finds time to stay dedicated to her studies. With her prize, Grace intends to buy gifts, including a computer and luggage, for her mom, Kay Yuquimpo, a nurse at The Medical Clinic at Camp Casey, and her dad, Chief Warrant Officer 3 Nick Yuquimpo, who is assigned to Camp Red Cloud. Drew Koike, a 10th-grader at School Without Walls High School in Washington, D.C., won the third-place prize—a $500 Exchange gift card. He received his prize during a presentation at the Joint Base Andrews Exchange. He’s the son of retired Master Sgt. Jason Leinen and Miyuki Koike. “The program has motivated me to strive for better grades every time,” said Drew, who maintains a B average while staying involved with extracurricular activities, including Model United Nations, cycling and lacrosse. Air Force Chief Master Sgt. Sean Applegate, the Exchange senior enlisted advisor, praised the winners for their hard work. Through the Exchange’s You Made the Grade program, first- through 12th-graders with a B average or higher are eligible to receive a coupon book filled with Exchange discounts and a sweepstakes entry form for a shot at a $2,000, $1,500 or $500 prize. The program is intended to reward military students who excel in the classroom. Those who enter must be dependents of authorized Exchange shoppers. Shoppers can visit customer service at their local Exchange for a coupon booklet and sweepstakes entry form. DAVIS-MONTHAN AIR FORCE BASE – As the daughter, wife and mother of Airmen, Donna Flynn appreciates the sacrifices service members make. And, for nearly 25 years, Flynn has worked tirelessly to support Airmen, military families and retirees through the Army & Air Force Exchange Service. 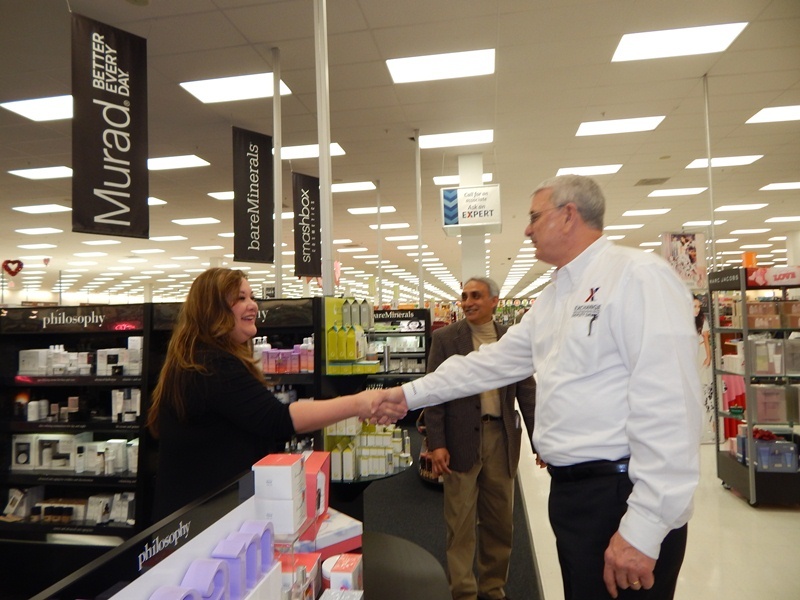 “It’s gone by fast,” Flynn said of her career working as a cosmetics and fragrance vendor representative who supports the Exchange onsite at Davis-Monthan Air Force Base. 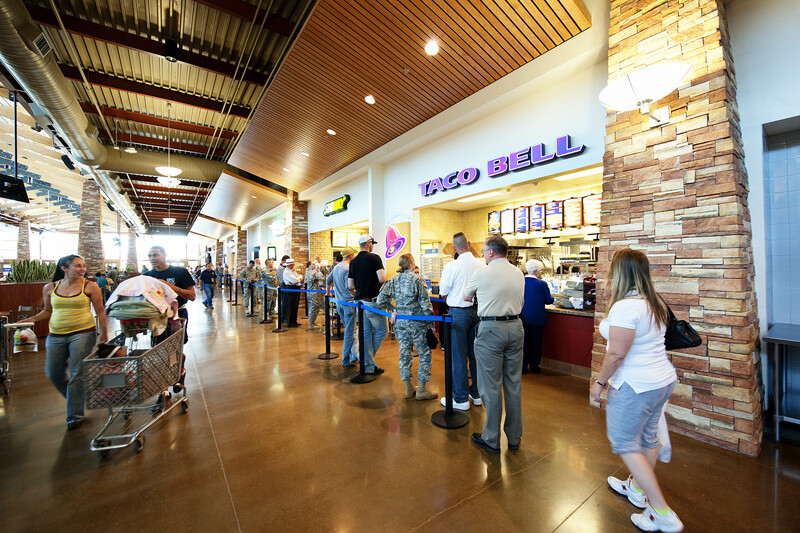 For almost 19 years, Flynn has been a mainstay at the Davis-Monthan Exchange. Shoppers will find her at the Exchange’s beauty bar, making recommendations for fragrances and Philosophy cosmetics. She came to Davis-Monthan in 1997 with her husband, Col. Collin Flynn, who retired from the Air Force 14 years ago. Her long career of service exemplifies the Exchange’s core value of family serving family. Through her work as an Exchange vendor representative, Flynn keeps Davis-Monthan shoppers close to her heart. Davis-Monthan Exchange General Manager Robin Chetri appreciates Flynn’s outgoing, friendly nature. Before coming to Davis-Monthan, Flynn supported vendors at the Offutt Air Force Base Exchange in Nebraska as well as Exchanges in the Washington, D.C., area while her husband was assigned to those locations. She’s spent the most time at the Davis-Monthan Exchange, and all told, has worked to improve the lives of Airmen, spouses and retirees for nearly a quarter of a century. Long before she met her husband, Flynn understood the sacrifices of Air Force families. Her father served in the Air Force throughout her childhood. She was born at Shaw Air Force Base, S.C., and her dad’s career took his family all over the country, including Hawaii, Japan, California and Colorado. Flynn met her husband while he was a cadet at the U.S. Air Force Academy. While he served, they raised two children. Those children also chose the Air Force as a career. Her son, Capt. Brian Flynn, serves at Offutt Air Force Base, while her daughter, Capt. Christina Flynn, is an operations officer for the 355th Force Support Squadron at Davis-Monthan. From the beginning, the Exchange has been part of Flynn’s family. In fact, the Exchange has been a part of her children’s lives, too. When her children were students in the ROTC program at the University of Arizona, they, too, followed in her footsteps and worked as vendor representatives at the Davis-Monthan Exchange’s PowerZone. “The Exchange always worked around their cadet schedule,” Flynn said. After nearly 25 years of serving Airmen, spouses and families, Flynn has no plans to slow down. She’d like to work another five years before retiring. DALLAS – Two Army & Air Force Exchange Service associates were recognized with prestigious awards from the National Defense Transportation Association (NDTA) on Jan. 21 at the Exchange headquarters building in Dallas, Texas. Roger Neumann, vice president of contingency plans for the Exchange, received the NTDA Distinguished Service Award. Neumann, an Air Force veteran and Legion of Merit recipient, has been involved in NDTA for more than 20 years and currently serves as the organization’s Texas state president. During the Exchange’s planning for Operation Inherent Resolve in Iraq, Neumann coordinated the re-establishment of Exchange Imprest Fund (unit-run) stores at seven locations and two direct (Exchange associate-run) operations. He also led Exchange drawdowns in Afghanistan, reducing the number of facilities from 25 to 12 and repositioning four Mobile Field Exchange trailers to Kuwait for reuse. Ian Womack, logistics analyst for the Exchange and vice president of communication for the Dallas-Fort Worth NDTA chapter, received the NDTA Young Executive Award. Womack developed and implemented a route review matrix for the Exchange fleet that helped reduce the cost per mile by 14 percent in 2014. He also volunteered at the Dan Daniel Distribution Center in Newport News, Virginia to ensure seasonal packages were delivered on time to customers around the world. Neumann and Womack were selected from nominees representing NDTA chapters across the world. The awards were presented by Jim Veditz, senior vice president of operations for NDTA. Members of the Exchange’s leadership team present included Director/CEO Tom Shull, Chief Operating Officer Michael Howard and Air Force Chief Master Sgt. Sean Applegate, Exchange senior enlisted advisor. About NDTA: The National Defense Transportation Association (NDTA) works to benefit national security and defense through education and knowledge sharing in logistics, transportation and passenger travel. NDTA provides a trusted environment – that does not otherwise exist – for government, military and private sector experts in the Joint Logistics Enterprise to build working relationships and develop the next generation of professionals. Every Wednesday, diners can take $2 off any salad priced $4 or more at participating Exchange direct-operated restaurants. “Salad Wednesday” is part of the Exchange’s BE FIT initiative, designed to promote healthy lifestyles for Soldiers, Airmen, retirees and military families. In addition to “Salad Wednesday” savings, diners who use their MILITARY STAR card will receive an additional 10 percent discount at Exchange restaurants. Exchange restaurants are open to anyone – whether military, civil service, contractor or visitor – per Army Regulation 215-8 and Air Force Instruction 34-211 (I). For more information or to schedule an interview with an Exchange representative please contact Maj. Tia Winston, 214-312-6082 or winstontc@aafes.com. DALLAS – Military students who excel at serving their communities can earn cash for college by telling their stories in an essay contest sponsored by the Army & Air Force Exchange Service and Unilever. Through the worldwide Rewards of Caring scholarship contest, four winners will each be awarded a $5,000 scholarship. To enter, authorized students in grades six through 12 with a 2.5 or higher grade-point average can submit an essay in English of 500 words or less explaining their involvement in community service projects and why their community is important to them. No purchase is necessary. Rewards of Caring scholarship contest winners will be notified on or about May 1.